A native of Louisiana, Joshua Castille began acting when he was 11, first in student plays, later in community productions. He gained entrance to Lafayette High School's Performing Arts/Theatre Arts Academy, and, after graduating, entered Gallaudet University. 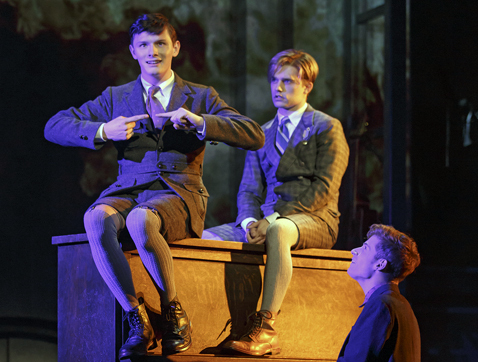 He was encouraged to audition for Deaf West's production of Spring Awakening. Cast as Ernst, he joined a gifted Deaf and hearing cast. "That show changed my life and put me on the map." That smash led to a role in other smashes. He played Billy in Nina Raine's comedy Tribes (in Pittsfield, Massachusetts and Seattle). In 2016, Glenn Casale became the first director to cast a Deaf actor, John McGinty, in the title role of Quasimodo for his Sacramento and Los Angeles productions of The Hunchback of Notre Dame. McGinty was then cast as Orin Dennis in Kenny Leon's Spring 2018 Broadway revival of Children of a Lesser God. Then Casale made plans to mount a production of Hunchback at Seattle's 5th Avenue Theatre. Castille auditioned and sent a video. Casale was delighted, and so were the audiences. Playing Quasimodo was a demanding, physically taxing role. Castille worked out a system of cues with the rest of the cast. E.J. Cardona played a gargoyle friend and his voice, and the two achieved a beautiful synthesis—Castille's animated signing and Cardona belting out the lyrics. Castille told us, "I loved the entire experience."